By: Score and lyrics by Stephen Schwartz, book by Philip LaZebnik, adapted from Dreamworks Animation film. Produced by: TheatreWorks Silicon Valley, in collaboration with Fredericia Teater in Denmark, where it will be staged in 2018. This scene is why to not miss this show: Dancers create the sacred burning bush in the world premiere of "The Prince of Egypt," presented by TheatreWorks Silicon Valley at the Mountain View Center for the Performing Arts, through Nov. 5, 2017. Go see "The Prince of Egypt" at TheatreWorks Silicon Valley for the dancers. 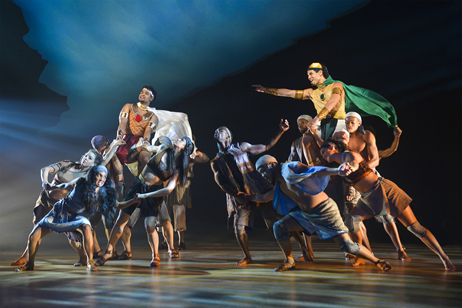 Choreographed by Sean Cheesman, the dancers are magnificent, and accomplish amazing things, serving as chariots carrying Diluckshan Jeyaratnam as Moses and Jason Gotay as Ramses, and flowing on stage like a river, both of water and of blood. 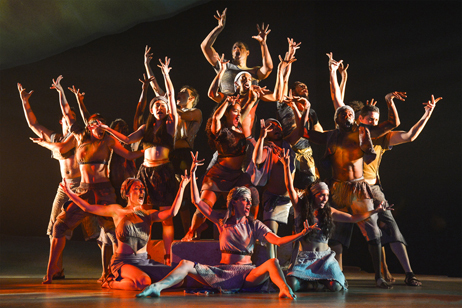 The dancers as the Burning Bush is one of the more magnificent bits of choreography I have ever seen. I was only disappointed that the scene ended too soon. That's partly because it was likely that after that fabulous scene, there might be another dull song to suffer through. Not all the music in this show was dull, but too much was snooze worthy. A frequent trick: Forcing a singer through a slow, boring ballad that ends on a BIG CHANGE IN DYNAMICS AT THE CODA! That technique, a mainstay of entertainment, allows the audience to be awakened by the louder music at the end, so they can stand up and cheer. As if the entire song deserved such applause. As a theater pro I chatted with at the intermission said, "It's a long way from Broadway." That is the truth. 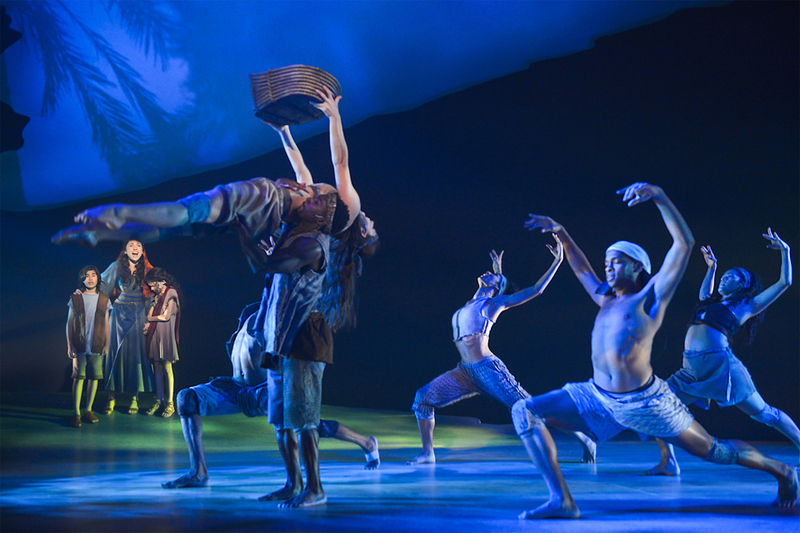 This show, which truly is an exciting production for TheatreWorks fans, involves Dreamworks Animation, which produced the 1998 animated film, and Fredericia Teater in Denmark, where the show is to open in April, with Jeyaratnam as Moses. It had a week of previews, which is rare for TheatreWorks, which paid off in some truly fabulous dancing, singing and acting. If a few of those dull songs were shortened or enlivened, this would be a better show. The music is by Stephen Schwartz, whose resume is impressive indeed: "Godspell," "Pippin," "Working," "Rags," "The Hunchback of Notre Dame," and others. Schwartz has a gift for big choral numbers, and the best numbers in "Prince of Egypt" are the big choral pieces. But the soul-searching solo tunes? Not so much. The audience enters to see a beautiful set, designed by Keving Depinet. There is a raked and sinuously bordered stage piece that serves as desert and as an Egyptian palace. In the background, a huge, off-shaped thing that serves as clouds and might Egyptian buildings, with the help of Shawn Sagady's projections. The colors are captivating. William Liberatore conducts the nine-piece orchestra from the pit, doing an excellent job with Stephen Schwartz's music, even the dull parts. The cast is, indeed, excellent. Jeyaratnam is charismatic and appealing as Moses, the smart one of the pharoah's two brothers, as he and his brother Ramses have a wild time as young men, before maturity and responsibility are forced on them. Gotay is very appealing as Ramses, true son of the pharaoh. Gotay manages a complicated and sincere character arc, from rapscallion young man to the become the pharaoh himself, "the least free man on Earth." Tom Nelis was very appealing at Pharoah Seti, father to Ramses and adoptive father to Moses. He has to carry the pharaoh from charismatic strength to failing health. "The pharaoh is never ill!" says Will Mann as Hotep. "Until he is dead." Mann is imperious and strong, and still delivers the occasional amusing line with panache. Christina Sajous was very appealing as Queen Tuya, who finds the baby Moses in the rushes and decides to adopt him. She is a key presence several times as the ancient story unfolds. Ayelet Firstenberg was very touching as the real mother of Moses and Aaron and Miriam, who gives up her baby in hopes he can avoid becoming a slave. David Crane was very good as the grown-up Aaron, who doesn't  at first  think Moses is a real Hebrew when he returns from being cosseted as a son of the pharaoh. Julia Motyka is vital as Miriam, saving Moses from the wrath of his angry people. Breannan Lark was terrific as Tzipporah, who escapes from the palace but unknowingly steals Moses' heart. Jamila Sabares-Klemm was a force of nature as the snotty, arrogant Nefertari, who eventually comes to love Ramses. The cast and chorus overall were truly excellent, in fabulous voice. I was pleased to see that Katherine Dela Cruz is in this cast, although I failed to know that while watching the show. There are 28 people in the cast, and lots to see. But I am sorry my eyes did not find Dela Cruz, who was excellent in shows I have seen elsewhere; this is her TheatreWorks debut. Ann Hould-Ward's costumes are terrific, from Egyptian royalty to Hebrew slaves. 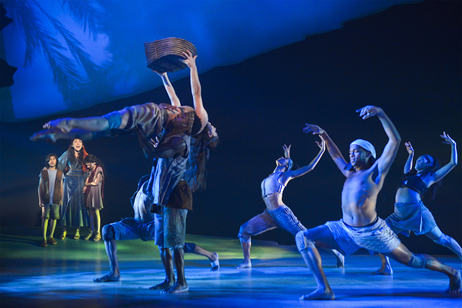 Mike Billings' lighting design played a key role, as did Cliff Caruthers' excellent sound design. The show, with book by Philip LaZebnik, was directed by Scott Schwartz, son of Stephen. Scott Schwartz did an excellent job, and this is a very impressive production. Except for occasional dull, forgettable tune. Baby Moses floats down the Nile River in the world premiere of "The Prince of Egypt," staged by TheatreWorks Silicon Valley at the Mountain View Center for the Performing Arts, through Nov. 5, 2017. In the background, Dylan K. Curtis as young Aaron (also played by Oliver Copaken Yellin), Ayelet Firstenberg as Youcheved, and Natalie Schroeder as young Miriam (also played by Alexandra Van De Poel) watch the baby travel. Katherine Dela Cruz as Queen Tuya's assistant, left, holds baby Ramses as Christina Sajous as Queen Tuya introduces her son to Moses, the new addition to their family, in "The Prince of Egypt," staged by TheatreWorks Silicon Valley. Diluckshan Jeyaratnam as Moses, left, and Jason Gotay as his brother Ramses race their chariots through the temple and the marketplace in "The Prince of Egypt," presented by TheatreWorks Silicon Valley at the Mountain View Center for the Performing Arts through Nov. 5, 2017. 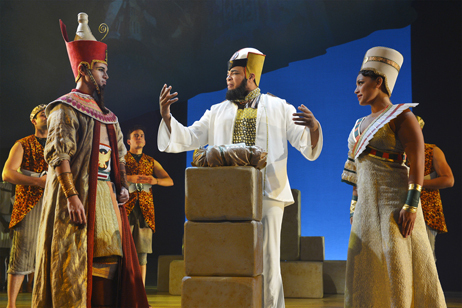 Jason Gotay as Ramses, left, and Jamila Sabares-Klemm as Nefertari look on while Will Mann as High Priest Hotep chants the child's prayer of protection over their new son in "The Prince of Egypt," presented by TheatreWorks Silicon Valley at the Mountain View Center for the Performing Arts, through Nov. 5, 2017.